Walking in the early morning and leaving the Shibuya Excel Hotel to encounter the thousands of Tokyo commuters milling around Shibuya train station, the thing that strikes you is the silence. A silence punctuated with the click clack of high heels and the public announcements over the tannoy. Salary men and salary women on the march. Solemn. Silent. Not yet adjusted to the new day, quietly, sleepily they move in sweeping masses, herded on to trains where mobile phones are always on silent. Nobody talking. Fast forward to the evening, and it has all changed. In the station, loud conversation and laughter drown out the tannoy’s public announcements. The clickety-clack of high heels goes unnoticed. The early morning solemn faces are now animated, more cheerful. Smiles are seen. Salary men and salary women are unwinding. Unwinding after the working day.The march has changed its beat. The sweeping masses are no longer herded along. Time has slowed a little. On the streets, small groups gather. The rush to get where they have to go to has gone. Night time in Tokyo is so much fun. First of all, you are in the safest major city in the world. Crime is not a threat at all. You feel safe. Secondly, the people come to life. Japanese are naturally curious and friendly. At times, this is not revealed, but after a long day working and a few hours kicking back with a few drinks they come out of their shells. I was hanging around the crossing with the big DSLR hanging around my neck. Like cow in a field with a bell alerting all and sundry to the fact that I was there. Yet, not once did I meet anyone who was put out that I was photographing them. Instead, many of them became animated when they saw me. The short series of images I am going to post to Flickr over the next few days are of an encounter like this. Once the green man appeared signalling it was time to cross I saw this elderly man in a trench coat and hat coming towards me. His coat, unbuttoned, blowing in the breeze created by the passing traffic. Perfect. Weaving amongst the pedestrians to get in line with him, I noticed he had seen me. Initially, I thought I had lost the opportunity, as I prefer to stay out of the scene I want to photograph. I do not like when my intervention converts the situation and those I am shooting recoil and react to the camera and me. Very often the moment is lost then. But this guy was performing for the camera. I got two as he approached and one when he was past me. The curious thing was that once he passed me, his demeanour changed. The iPhone photograph is a simple one. 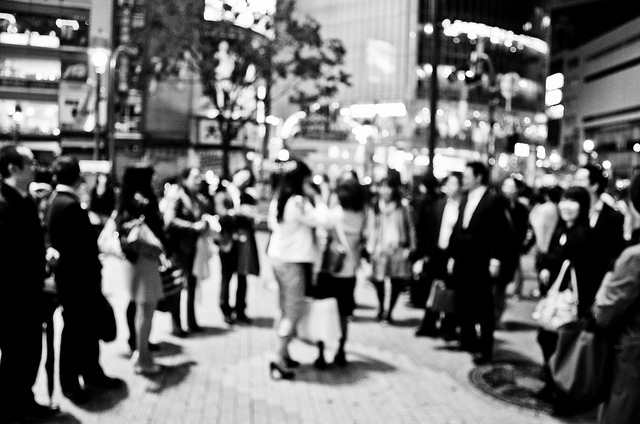 Taken again at the crossing in Shibuya. 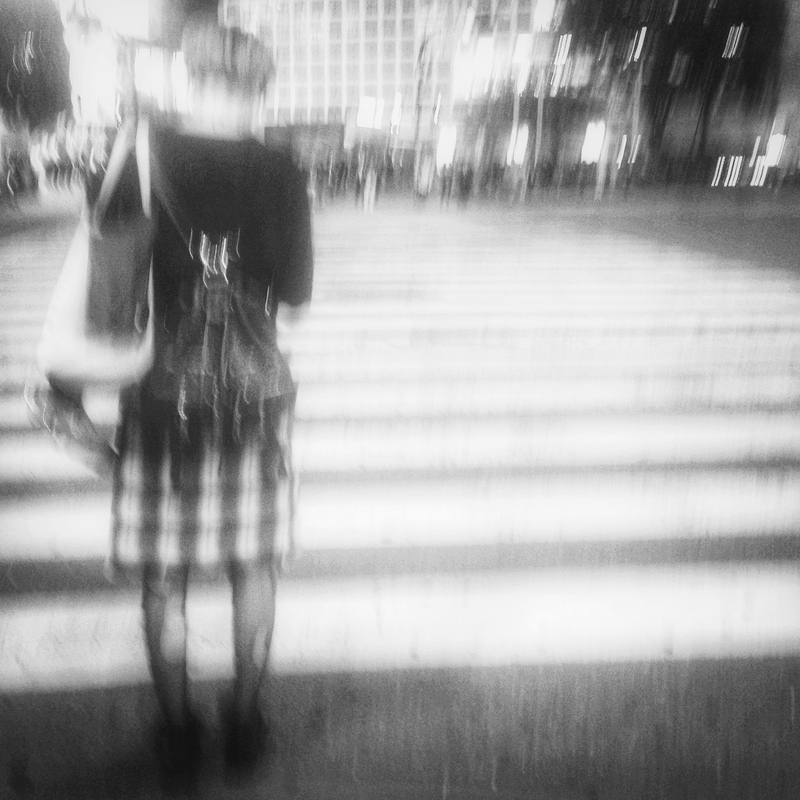 The woman’s skirt with its black and white check complemented the black and white lines of the pedestrian crossing. I stood behind and took the shot. The technique I used to blur it was to lower the camera with my finger on the shutter. Then I raised it quickly and released to create the blur effect. 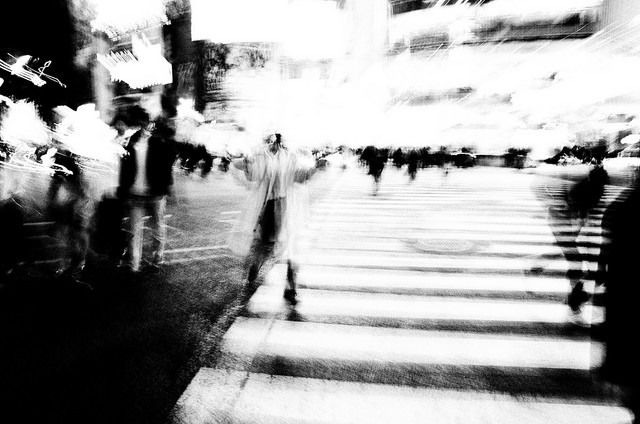 This entry was posted in Daily posts to Flickr, iPhone, photograph posts, Street Photography.